In this post I am going to discuss on Export Selected GridView Rows to Excel in asp.net. We oftenly come across the situation to bind the data and based on the selected rows we need to export rows into a Microsoft Excel file. Export Selected Gridview Rows to Excel in ASP.NET 2.0,3.5,4.0, in C#. It is bit complex task. We can learn how to bind the GridView manually, How to get the selected rows into an ArrayList, Change the Controls to value and finally Export Selected GridView Rows to Excel. ASP.NET Gridview is a flexible control, and we can do the paging, adding,updating, deleting the records, sorting and Export Selected GridView Rows to Excel. Let's see a sample program to bind the data and export to Microsoft Excel. Now Drag the GridView from the tool box and update like as below code snippet. From the above .ASPX page We have added one gridview ,in the template field added one CheckBox control , LinkButton control and bound field as StudentName, FatherName, City, Country as gridview columns.Here I binded the gridview like as <%#Eval("StudentID") %>. And added one button control to generate the Excel file. You can have a look at the below code to bind the gridview, what is the method I followed. 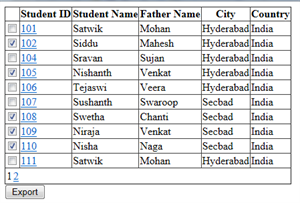 Here I have taken one DataTable object and added the columns, after that added the rows to DataTable object. Please note that to bind the gridview, I have not connected to any database or the XML file. In the Next step, I would like to find the selected/Checked rows from the gridview and assign to a ArrayList class. The ArrayList is class and it a flexible one, whose size will be increase at runtime based on the assigned data. From the above, FindSelectedRows() method, we have declared one ArrayList class and checked for the View state is existed or not, if view state is already assigned that data is assigning to ArrayList class. In the next step, looping each row in a gridview and finding the check box is checked or not, if yes assigning the StudentID to ArrayList Class. Above,on RowDataBound event we are checking the condition for the view state, if already assigned, restoring that data to Arraylist class and selecting the check boxes present in the gridview. Above code is for converting the controls data into the literal controls data to easily assign to MS Excel. Above code produce the MS Excel file like as below screen shot with a file name GridViewToExcel.xls and prompt for Save or View.